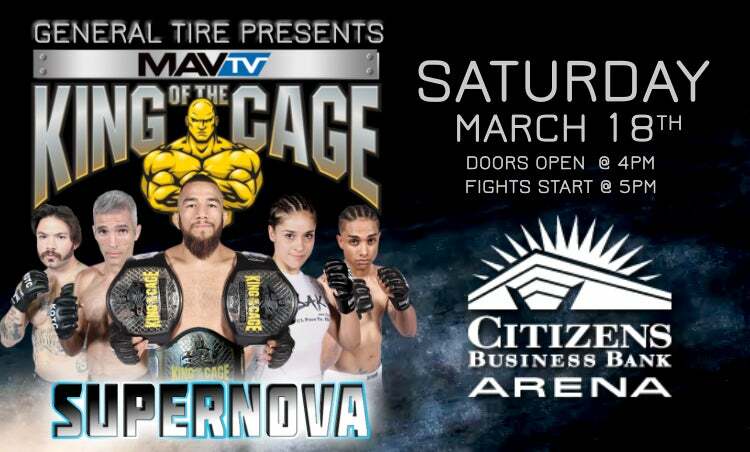 King of the Cage Returns to Citizens Business Bank Arena on March 18 for "SUPERNOVA"
RANCHO CUCAMONGA, CA. (January 30, 2017) – King of the Cage returns to Citizens Business Bank Arena in Ontario, California on Saturday, March 18, 2017 with another world-class mega-event headlined by two World Title fights between current champion Juan Archuleta vs. Brandon Hastings for the Lightweight Title and current champion Ryan Fillingame vs. Buddy Clinton for the Jr. Welterweight Belt, as well as a co-main event in the Women’s Strawweight Division featuring Cynthia Arceo vs. Peggy Ross. Current KOTC Champion Juan “The Spaniard” Archuleta (13-1), Hesperia, California (Joe Stevenson’s Cobra Kai) vs. Brandon “The White Tiger” Hastings (5-2), Victorville, California (White Tiger Martial Arts). Archuleta has won his last 9 fights and is top ranked. Hastings won his last bout with an impressive second round knockout. Current KOTC Champion “Prince” Ryan Fillingame (5-1) from Victorville, California (Team Diamond MMA) vs. Buddy Clinton (10-5), Hurst, Texas (Team Royce Gracie). Fillingame is one of the top up and coming stars in MMA. Featured Event - Bantamweight 135 lbs. Johnny “Kid Kvenbo” Munoz (3-0), Norco, California (CQuence Jiu-Jitsu) vs. Paul Webb, Hemet, California (Team Quest). Munoz in undefeated and has won all his fights in impressive fashion. Webb has won six bouts in his professional career. Featured Event - Lightweight 155 lbs. Doors open at 4:00 pm. and fights start at 5:00 pm. Reserve seating and Ringside tickets are on sale now. For more information or to purchase tickets, please visit Ticketmaster.com. All ages. Event card subject to change.